A battle over labor negotiations in an Idaho County school district could go before a jury. The Idaho Education Association last week filed two lawsuits against the Mountain View School District. The lawsuits accuse trustees of failing to negotiate in good faith, violating teachers’ free speech rights and refusing to release public records. The lawsuits come as the local teachers’ union and trustees remain at odds over a contract. The district has proposed cutting $1.6 million from its budget and has refused to collect $400,000 from a voter-approved levy, IEA spokesman Dave Harbison said in an email. The budget cuts “could entail releasing up to 11 teachers and discontinuing or reducing a number of programs,” Harbison said. The district employs 90 full- and part-time teachers, who have been working without a master agreement since June 30. The district isn’t talking. Mountain View board chairman Lot Smith declined to comment to the Lewiston Tribune, saying he hadn’t been served with the lawsuits. The board did hold a closed executive session Monday night to discuss the lawsuits and teacher negotiations, the Tribune reported Tuesday. The IEA says the district “has refused and is presently refusing to meet and confer in good faith” with its member organization, the Central Idaho Education Association. The IEA says district officials pledged to meet with union officials to discuss the salary schedule and employee benefits — a promise made when the parties agreed to a 2017-18 master agreement in August 2017. Those meetings never took place. The IEA says the district violated union members’ First Amendment rights by forbidding them from wearing t-shirts bearing the local union logo and the slogan, “Support Educators, Support Kids.” In September, district Superintendent Marcus Scheibe said teachers could not wear the shirts while working in an official capacity. The IEA says the district has failed to release invoices outlining the district’s legal costs, claiming attorney-client privilege. The Mountain View School District is based in Grangeville. The far-flung district takes in 8,300 square miles — an expanse larger than the state of Massachusetts — and an enrollment of about 1,250 students. The district has a $14 million budget and a $4 million cash reserve. The district will collect a $2.66 million supplemental levy this year — after trustees agreed in August to reduce the levy. More reading: Here’s more on the Mountain View budget situation from Justyna Tomtas of the Lewiston Tribune. 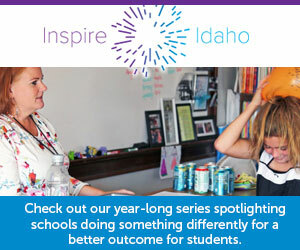 Teacher pay is the main sticking point in the sprawling Idaho County district. Union negotiators say the district needs to fix flaws in its salary schedule.